Toni Eyssallenne is a Haitian-American physician and a graduate of the 2010 JMH Med-Peds Residency Program. The Jackson Health System is located in the heart of Miami and as the county hospital provides care for the undeserved and the “never served” including the neighborhood of Little Haiti. In February of 2010, an earthquake demolished Haiti at its core and capital Port au Prince. At the core of our joint missions at JHS and UM is providing service to our community. Many of our faculty, staff, students and housestaff are of Haitian descent and were hard hit by the devastation in their home country. Haiti is part of our community. Toni was amongst the first responders to arrive in Port au Prince. She spent her 4th year research elective month working as the acting Chief Medical Officer (CMO) in the UM medical tents. Due to her superb performance during the post-earthquake disaster, she was appointed as the Chief Medical Officer for Project Medishare and Hospital Bernard Mevs. She joined our Med-Peds Faculty in 2011, as our Associate Program Director and Director of our Med-Peds Global Health Track while continuing to work as the CMO at Bernard Mevs. She is the co-creator and Program Director of the Pediatrics Residency Program at Hospital Bernard Mevs and Nos Petite Frere et Soeur/Hospital St. Damian’s, the only free standing children’s hospital in Haiti. In 2014, Toni was recruited by Partners in Health to become the Director of the ICU at their new hospital, Hospital Universitaire de Mirabalais. Toni is an avid New York Giants fan and often uses FaceTime from Haiti to talk about a game. 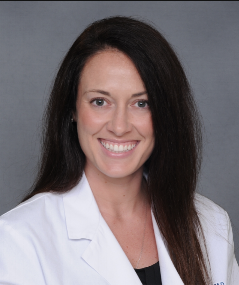 Kendra Van Kirk is a graduate of our UM/JMH Med-Peds Class of 2017 and joined the Med-Peds faculty as our new Associate Program Director in 2017. As a former teacher in Baltimore with graduate education in teaching and curriculum design, Kendra worked ambitiously to design educational programs during her time in residency. Notably, she designed an innovated Med-Peds ambulatory experience for interns and was key in the development and adoption of block scheduling in our pediatric department. As APD, Kendra is actively developing a longitudinal self-study curriculum in addition to a new Med-Peds clinic conference series which we will pilot in 2017-2018. She has also worked to co-create a new Urban Health Rotation for third year Med-Peds residents with training in addiction medicine, primary care for the homeless, and child/adolescent psychiatry. When asked to choose between Medicine and Pediatrics, her answer is simple: “I would choose both; I like both equally.” Her academic life follows the same vein. The variety of her administrative, clinical, educational, mentorship and research responsibilities inspire and motivate her, and she has a true passion for each. Dr. Brown calls it “The Med-Peds Curse” –we enjoy everything, all of the time. She feels lucky to work in an institution where she is given freedom to explore and encouragement for innovative. This philosophy of innovation and exploration carries over to our program philosophy where our strength lies in the diversity of our residents, faculty, community and education. Residents are encouraged to actively participate in development of curriculum and out of this were born options for several tracks, including Women’s Health, Hospital Medicine and Global Health. Our global health track began in 2011 and has evolved to include 4 different Global Health Career Pathways and our Hospitalist Med-Peds and Med-Peds Primary Care tracks are being formalized this year. In addition to being a PD, Dr. Brown is also one of the Assistant Deans for Diversity and Multicultural Affairs with the responsibility for creating a learning environment that encourages and celebrates institutional diversity. This includes mentorship of Pre-Med undergraduate students from underrepresented minority groups and any medical student group based in culture, ethnicity, religion, gender or sexual orientation. In 2013-14 she is successfully worked with faculty and students from the LGBTQ student organization, “MedicOUT”, to create a Safe Space Program which will be highlighted at the 2014 AAMC annual meeting. This program is expanding and this year the group is working on a new longitudinal curriculum for LGBTQ education to include didactics and an elective rotation in Transgender medicine and surgery. On a personal note, Dr. Brown lives in South Beach, facing downtown Miami and Biscayne Bay, where the multitude of extracurricular activities available is only out measured by the beauty of her surroundings. In her time off, she belongs to a dinner club that meets every Monday night and on the weekends she enjoys outdoor activities such as biking, lying on the beach and searching for that magical 8th day in the week. Dr. Del Toro is a general internist providing primary care to adults at the University of Miami Hospital and Clinics. Her clinical interests include preventative care and management of chronic illness such as diabetes, obesity, hypertension, and cardiovascular disease. In addition to involvement in graduate medical education through the ambulatory component of the residency program, she is also heavily involved with undergraduate medical education, serving as co-director of the Problem-Based Learning curriculum. She teaches early medical students clinical physical exam skills, history taking and clinical reasoning and works with both third year medical students as well as residents in her clinic. She is particularly interested in teaching clinical reasoning and the private practice aspects of medicine. She enjoys educating residents and students about how to navigate the challenges associated with the “world of insurance”. Dr. Stephen Symes is an Associate Professor of Medicine in the Division of Infectious Diseases with the University of Miami Miller School of Medicine. He completed medical education at Howard University in 1989 and residency training in Internal Medicine at Jackson Memorial Medical Center in 1992. He served as Chief Medical Resident at the VA Medical Center in Miami, joined the faculty of the Department of Medicine in 1994, started as Associate Program Director of the Internal Medicine residency program in 1997, and was promoted to Program Director in June 2006. Dr. Symes has clinical activities in HIV and AIDS. As Program Director for the Jay Weiss Residency in Global Health and Social Medicine (beginning in 2005), he developed a pathway to train future physician leaders in global/domestic health program administration and advocacy, preparing them to effect change in health/social policy. As program director for the core Internal Medicine residency training program, Dr. Symes focused on post-graduate resident education, emphasizing career development and mentoring. With his work in HIV and social medicine he continues to address health disparities and vulnerable populations, starting a Human Rights clinic at San Juan Bosco clinic for victims of torture and abuse. Appointed as Assistant Dean for Diversity and Multicultural Affairs in December 2010, Dr. Symes will continue to work with the Miller School of Medicine in building a robust, culturally diverse workforce in healthcare. Dr. Diaz, whose father was a Cuban expatriate executive, was born in Ohio but grew up in Brazil, Venezuela, Argentina and Miami. She has an undergraduate degree from Drew University, completed her medical degree at the Miller School of Medicine in 1997 and her Internal Medicine Residency in 2000. She joined the faculty immediately after residency, adding the role of Associate Program Director in 2004. In a recent article from UHealth News, Dr. Diaz “credited the mentors she encountered during her own residency, as well as the diversity and breath of the Miller School graduate medical education program, for her decisions to pursue a career in academic medicine at UM.” Her leadership skills and knowledge of graduate medical education led to her appointment in 2012 as the Chief Academic Officer at the University of Miami Hospital.